RIO DE JANEIRO, BRAZIL – Famous for its vibrant culture, music and arts, scores come to Rio each year from all over the world to get a taste of the magic. When tourists try to pack in some cultural stops in between the sunny beaching, culinary delights and nightlife, they turn to a number of guidebooks and websites that often overlook or undersell a hidden gem: the Parque Lage. Parque Lage, photo by Matthew Levine/Wikimedia Creative Commons License. A sad fact is many visitors in Rio end up returning home not having ever heard of or seen the beautiful Escola de Artes Visuais (School of Visual Arts) or EAV at Parque Lage. The school, which was founded in 1975, resides in a magnificent Italian style structure that stands in the midst of the botanical garden. This beautiful building was actually built in the early 1920s to celebrate the owner’s ardent love for his Italian opera singer wife. Around a glittering green-blue pool of water, students spill out of their studios and work on canvases and sheets of paper tacked on to support boards and walls of the corridors. One side a café, also open to the public, bustles with young people sipping coffee and discussing their work. At the other end, there are the school galleries that host various exhibitions the year round. 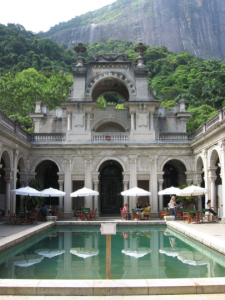 The Parque Lage, in which the school is situated, was established much earlier in 1660 and spreads over 128 acres, forming part of Tijuca National Park. Through the leafy passages, looked over by Mount Corcovado, people can be found walking amongst the enchanting gardens discovering hidden delights all over. Branches and vines hang over the paths that maze through the gardens, photo by Rob Sawers. A turn behind a large fallen tree trunk takes one inside a man-made cave with twelve built-in aquariums that house exotic fish. A turn the other way reveals a fountain. Further forays into the park and over the bridges take visitors inside many other caves and even a tower. Others just stroll on the winding pathways enjoying the park or stopping to snack at picnic spots. 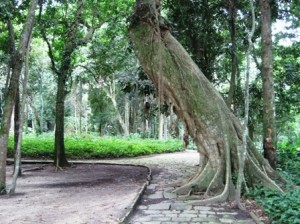 More adventurous people can hike on the natural trails that go up to Christ the Redeemer. Both the school and park are open to the public and located just a short walk from Jardim Botanico – the wonderful botanical gardens of Rio. Sadly countless people have walked past EAV on their way to the botanical gardens without even knowing it was there. So whether traveling in Rio for adventure or business, visitors must treat themselves to this little piece of culture and history and take away an experience that they will always remember. Address: Rua Jardim Botânico, 414, Jardim Botânico. i was looking for art supplies to paste some posters up on the street in rio + I googled “art supplies rio.” i am so thankful to come across this link for parque lage. i’ve been in the city about 10 days now. earlier in the week i was at the botanical gardens + i started the day at the museum of modern art. i found the general scene (art, gardens, restaurant, friendliness of staff), at parque large to be nicer than my experiences at mam + the botanical gardens. and, they had the art supplies i wanted!